Fast and Free Stage Designs and Expert Advice. Having a tough time deciding which staging will work for your needs? Our friendly staging experts are here to help and we do all the work for you! 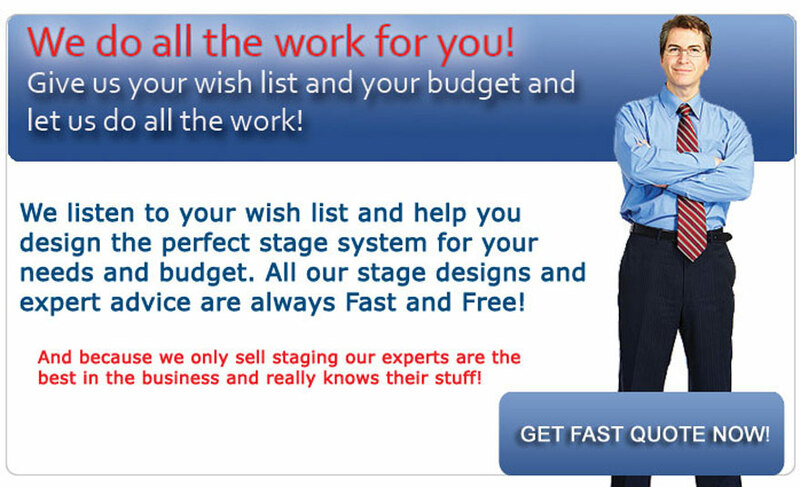 We will listen to your wish list and help you design the perfect stage system or riser system for your needs and budget. We carry all the major staging brands (not all our products are featured on our website). Our experts will listen to your needs and send you a customized Free design proposal and quote in about 10 minutes! It's that simple. Simply call us at 877-884-3426 or email us at orders@thestagedepot.com for a Fast Quote. Even if you don't see exactly what you need on our website, you can be sure we carry what you need. Call today for your free design consultation. We will take care of the rest and email you a custom stage design quote the same day.